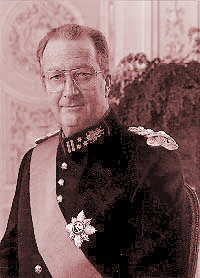 King Albert II was born in Brussels at the Château du Stuyvenberg on June 6, 1934. He is the son of King Leopold III and Queen Astrid, born Princess of Sweden, and the grandson of King Albert I and Queen Elisabeth. On July 2, 1959 Prince Albert married Donna Paola Ruffo di Calabria of an Italian family with royal connections. King Albert II and Queen Paola have three children: Prince Philippe (born on April 15, 1960), Princess Astrid (born on June 5, 1962) and Prince Laurent (born on October 19, 1963). Albert II ruled from August 9, 1993 until his abdication in favor of his eldest son Philippe on July 21, 2013.